You sometimes get the sense ‘Made in England’ is a moniker much more caught up with current trends, than rooted in substance. Since the boom in at-home manufacturing five or so years ago, there’s been no shortage of stories about menswear brands craftily leveraging patriotism to push wares they’ve actually just designed in England, but had entirely made elsewhere. Not so Ben Sherman. Born in Brighton in 1963, the homegrown brand beloved of mods takes its Britishness very seriously, each season producing a capsule collection constructed from top to bottom on these shores. Ben Sherman Made in England celebrates the label’s roots, comprising outerwear and shirts that fuse premium fabrications – including specially sourced British and Italian cloth – with England’s heritage of craftsmanship. And, in a market overrun with marques trying to pull the wool over your eyes, it’s a refreshing reminder of what it means to be authentic. Here, we run down the collection’s highlights, and why you should consider taking them home. They don’t come much more British than this. Although the cloth for the first Harrington jacket was cut some time back in the 1930s, it’s just as much an outerwear essential today. Covered in a punchy dogstooth, Ben Sherman’s latest take harks (barks?) back to the vibrancy of 1960s style, splicing the pattern with considered military details including a contrast olive drab collar and copper zip. 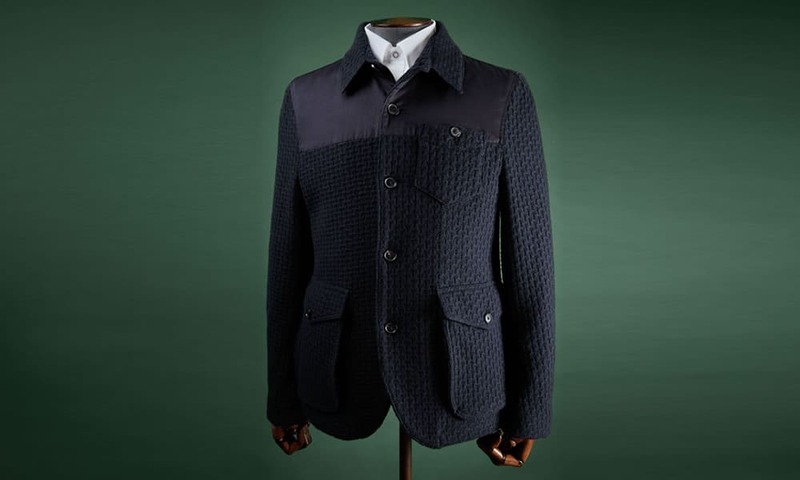 What’s more, this one comes crafted entirely from wool sourced from Lancashire’s Mallalieus of Delph textile mill – so you can be sure this ‘Made in England’ jacket makes good on its promise. Taking its cues from the iconic 1960s donkey jacket that won the hearts of skinheads and trade unionists alike, this knitted style is a future workwear classic you’ll want to cop whether you’re at the coalface in a quarry or creative studio. Built in Britain from a body of wool sourced from Tuscan mill Lanificio Fortex, it’ll keep the cold at bay without adding excessive bulk, so you can easily layer it over an Oxford shirt for a no-fail casual look or under a lightweight overcoat to skew a little more contemporary. In keeping with the collection’s authentically English stamp, you’ll find British twill trimming at the shoulder, elbows and undercollar. We might be loathe to admit it, but some of our nation’s most treasured wardrobe staples stem from across the pond. Indeed, Arthur Benjamin Sugarman, Ben Sherman’s founder, launched the brand to give 1960s-era mods a locally produced alternative to the imported American shirting they found themselves so enamoured of. This jacquard design, then, commemorates that cross-pollination, combining paisley and oversized tartan with details like the Ivy League locker loop. A hallmark of mid-century American-made shirts, it’s unlikely you’ll use this shirt’s locker loop for its intended purpose (easy storage in a gym locker), but it looks smart all the same. Not all men are cut from the same cloth. Which is why it’s reassuring to know colder weather doesn’t have to mean taking cover in something as civilian as a solid-colour navy or grey overcoat. If your taste skews a touch more outré than ordinary, then Ben Sherman’s Epsom coat is just the thing to stop you from blending in. Based on an old-school Regency riding style, its oversized Princes of Wales check and contrast felt back collar make it a winter coat that won’t go unnoticed. Plus, it’s made from wool specially woven by Somerset mill Fox Brothers and nods to mods with a three-button front and signature Ben Sherman gingham lining. Bravo. Wearing prints in winter is no mean feat. Darker days usually means stowing away showier pieces in favour of steering subtle. But that’s not an excuse to spend three months clad entirely in black and navy either. In-between pieces like this micro geo print shirt help strike the balance between statement and season-appropriate. Cut from 100 per cent cotton in Ben Sherman’s signature ‘Mod’ (read: regular) fit, it’s replete with details that’ll instantly elevate your off-duty looks including real mother of pearl buttons and the brand’s distinctive box pleat and locker loop to the back. Wise to the fact that florals aren’t one-size-fits-all, Ben Sherman presents this slightly more subdued take on the casual Friday favourite. It’s a thing of dark romance really, and not without a heavy whiff of the Beatles’ heady heyday; that said, you’ll want to quash the temptation to style it with shaggy coats and bell-bottoms and team with tailoring to play up its sharp fit instead. Cut to the brand’s ‘Soho’ (read: slim) silhouette, it’s also got darting at the back for a finish so clean you could eat your dinner off it. There’s never been a better reason to buy local. Leveraging a heritage of modernism and time-honoured British craftsmanship, Ben Sherman Made in England offers up fail-safe styles with plenty of spirit. Shop the Ben Sherman Made in England collection online now.